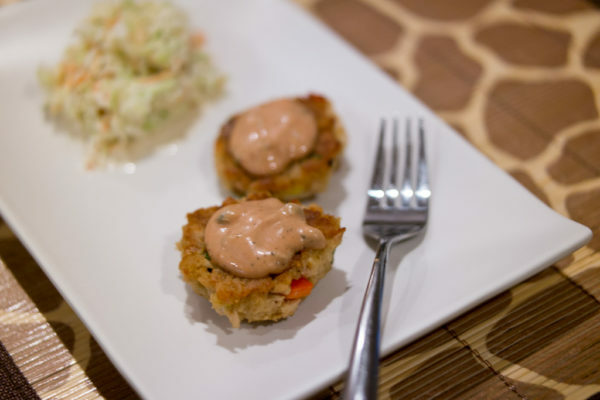 This tuna cakes recipe is perfect for a party appetizer or dinner entrée. I’ve served them to guests many times with the wasabi remoulade sauce and there are never any cakes left over. Line a baking sheet with parchment paper. Mix all ingredients well in a large bowl, breaking up the tuna pieces with the spoon. Form about 2 tablespoons of the tuna mixture into a 2-inch ball - or use a 1 ounce scoop to measure. Set on the parchment paper and press down gently to form a patty about ½ inch thick. If it breaks apart, reform and try again. If the mixture is too dry, add a little more mayonnaise to moisten. Repeat with the remaining tuna mixture. In a large sauté pan (12"), heat two to three tablespoons of oil and 1 tablespoon of butter over medium-high heat. Add the tuna cakes but don't crowd the skillet. Cook about three minutes, turning once and cooking another two minutes, until golden brown on both sides. Remove from the pan and drain on paper towels. For frying each batch of tuna cakes, wipe out the skillet with a bunch of wadded paper towels and add fresh oil and butter; otherwise, the oil could impart a burned flavor to the tuna cakes. To serve, arrange the cakes on a platter and garnish with sprigs of cilantro or parsley. Serve immediately with dishes of Wasabi Rémoulade. For gluten free breadcrumbs, toast 4 slices of Udi's gluten free white bread and whirl in a food processor until crumbs are fine. Nutrition information is for one tuna cake. Make-ahead: Make up the tuna cakes to the point of cooking, cover tightly with cling film, and keep in the refrigerator for up to 24 hours. Fry the tuna cakes when you're ready to serve.